Our Rubber Hand Gloves are mostly used, when one works in a factory or in hospitals. 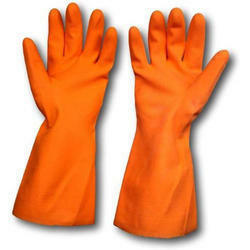 These Gloves are assured to be completely safe and are chemical resistant. Our Gloves provides protection against abrasions and cuts and firm griping. They can be used while handling wet or slippery object. These Gloves are long lasting and very cost effective. We are engaged in offering eye-catching range of Rubber Hand Glove.